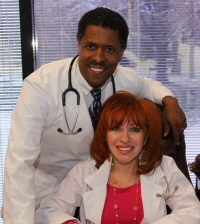 Marina M. Pearsall, M.D., Ph.D.
Read my Denver, CO Office Info and Patient Testimonials! Read my Houston, TX Office Info and Patient Testimonials! I received my medical degree in 1981, then completed a fellowship in cardiology and received a PhD in 1986 in cardiac physiology. Both my parents were doctors, and I found their passion for healing infectious. They practiced at a time when doctors relied on physical exams, when unraveling patient complaints was more of an art than a science. They taught me to LISTEN to my patients, to never dismiss patient complaints, however strange or unusual the complaints may seem. They taught me to be open-minded, so that I never stop learning and looking for answers. They taught me not to follow where the path may lead, but to go instead where there is no path…and leave a trail. I believe in treating the patient as a whole and not as his or her individual symptoms. Unfortunately, such an approach doesn't fit today's high-volume, minimum time per patient one symptom at a time medicine, so I decided to open my own practice. In an age of managed care and large medical corporations, this is no easy feat. Everyone I knew at the time said, "It Won't Work". With a long history of being a political refugee, I was not so easily intimidated. During this time I came across the new fascinating science of anti-aging medicine, and fell in love with it. Anti-aging medicine applies therapies or modalities that deliver very early detection, aggressive prevention, treatment or reversal of age-related dysfunction. While bio-identical hormone replacement therapy is the centerpiece of Anti-Aging Medicine, the key to living with dignity and pleasure for as long as possible is in reestablishment of the perfect balance of depleted aging-related hormones coupled with detoxification, drastic dietary modifications, nutritional supplementation, weight loss and exercise. I love what I do! Helping my patients get off the slippery slope of aging decline and making fundamental changes in the way they look, feel and live the rest of their lives fulfills my dream. Isn't that why I became a doctor? Marina M. Pearsall, M.D., Ph.D. is a second generation physician and co-founder of the Longevity Centres of America. Dr. Pearsall is a pioneer of the "Pellet Implant" method of Bio-Identical Hormone Replacement and IV Micronutrient Therapy. Dr. Pearsall helps women and men relieve the symptoms of menopause, andropause (the male menopause) and the symptoms associated with aging. I received my medical degree in 1992, entered into Trauma Surgery Training at MLK County Hospital, Los Angeles and joined the US Army Reserves. From 1993 – 1997 I underwent further General Surgery training at Chicago's Columbus Hospital. From 1997 – 1999 I finalized my training with Baylor's Family Medicine program in Houston, TX. This Renaissance-Style medical training experience has provided me with an in-depth exposure to both Primary Care Medicine and Speciality Care Medicine. My family is replete with physicians: Father, Father-in-Law, Mother-in-Law, Wife, Sister, Brother-in-Law and Brother. The combination of growing up in a Medical Family with a very broad training experience led me to quickly realize the Power of Prevention. As a Lt. Colonel with 4 overseas deployments to my credit, I understand the obligation to attend to the acutely injured Soldier. As a private practitioner, I also under the need for a stronger, more fortified brand of Preventative Medicine. Early in my career I have discovered and joined the field of medicine known as Anti-Aging Medicine. Anti-Aging Medicine is a clinical specialty that is founded on the application of advanced scientific and medical technologies for the early detection, prevention, treatment, and reversal of age-related dysfunction, disorders, and diseases. It is a healthcare model promoting innovative science and research to prolong the healthy lifespan in humans. Afterall, when health is absent, wisdom cannot reveal itself, art cannot become manifest, strength cannot be exerted, wealth becomes useless and reason is powerless. Within the Patient-Doctor relationship, I perceive my role as that of a Teacher or a Coach and not that of an overbearing figure who barks out orders that should be followed to the letter... or else. I think of myself as the calm GPS voice who helps guide my patients through a foggy cloud of confusion and caucophony of symptoms to a clear and defined path to wellness. This is my passion and I love my job. Gurney F. Pearsall, Jr., M.D. is a second generation physician and co-founder of the Longevity Centres of America and specializes in the fields of Orthomolecular & IV Chelation Medicine, Hyperbaric Oxygen Medicine, Autism Spectrum Disorder, Medical Weight Loss, Surgery and Family Medicine.